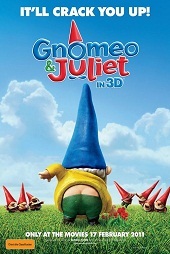 Gnomeo and Juliet takes Shakespeare's tragic tale of two warring families and twists it to tell the story of the gnome families, the reds (the Capulets) and the blues (the Montagues). 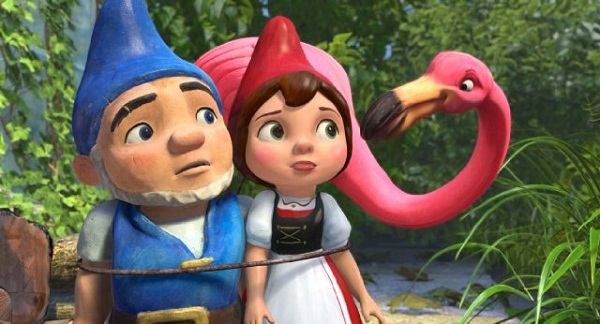 Gnomeo (James McAvoy), the son of the blue family, and Juliet (Emily Blunt), the daughter of the red family, meet late one night in an abandoned garden and sparks fly. The movie follows much the same course as the play (as much as G rated Disney film will allow! ), with a few additions such as Featherstone (Jim Cummings), the plastic pink flamingo. Personally I don't particularly enjoy watching 3D movies due to the annoying glasses and the lack of a crisp picture. 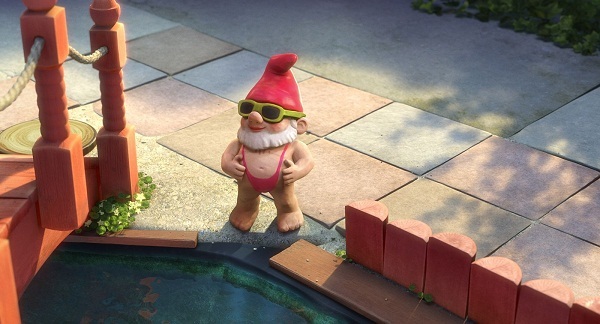 I feel like 3D is being used in films to try and draw in a thrill seeking audience, and in Gnomeo and Juliet it doesn't add anything to the character or plot development - it is simply there as a gimmick. There are some really great characters and moments in this film (not least of all Featherstone), yet they aren't fully utilized. Paris (Stephen Merchant) is hilarious as Juliet's prospective suitor, but the film is obviously dominated by its titular heroes, who aren't as funny simply because they are the serious core of the film. I wish it was funnier. It can sometimes be quite a chore to sit through children's movies, and while Gnomeo & Juliet isn't a chore, it also isn't consistently laugh out loud funny. The best part about this film for me was the casting. I spent huge amounts of time trying to pick the voices (which also include Michael Caine, Jason Statham and Maggie Smith), and even managed to pick quite a few of them. I also spent the entire film laughing at the soundtrack by Elton John. Most of his more famous songs have been redone to be included which kept me bobbing along throughout the film. I even found myself laughing out loud at Paris' incredibly camp homage to Elton. For young girls I think there will be more than enough in this film to keep them entertained - there is action, romance, comedy and drama. But I do think young boys may find it lacking, for aside from the scenes involving battling tractors and the battles between the two gardens, which are quite fun, the film feels aimed more at girls than boys. I still think it is a worthwhile film for any child to see, however. There are some very sweet moments, some funny moments, and I enjoyed the adaptation of Shakespeare's language at various points, especially in Juliet's balcony scene. It's an easy, non-challenging 90 minutes at the movies. The ending of the film nicely wraps everything up, making sure that all the characters get their happy ending. The only thing I was disappointed with at the end was the lack of happy ending for the human owners of the gardens.